There was a time when the banks of Pennsylvania’s creeks and rivers were rich with evidence of the area’s first inhabitants. Artifacts were once so abundant that not a second thought was paid to collecting them. It is not a difficult image to conjure when viewing the artifact assemblages housed at the State Museum of Pennsylvania’s archaeology collections. Sad as it may be, archaeological sites are non-renewable resources, for once the artifacts have been collected from a site, little to no physical evidence may remain of the people who once occupied them. 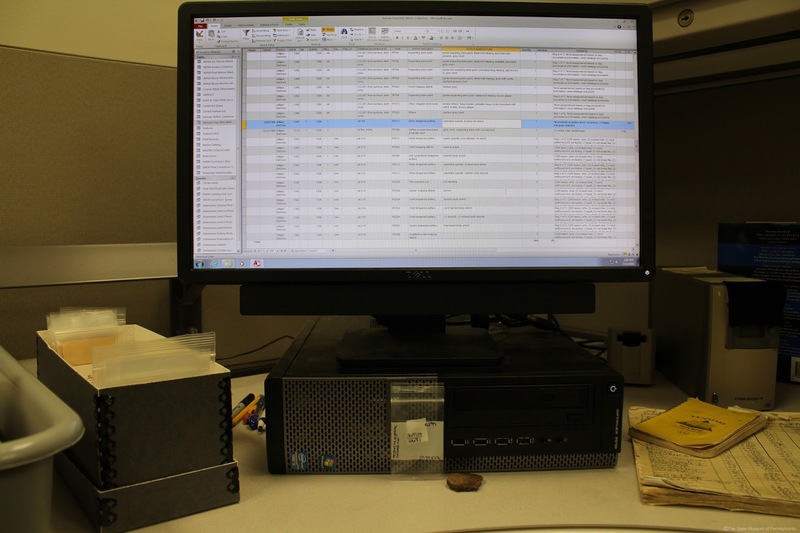 This emphasizes the importance of recording the provenience (location) of artifacts and recording the site with Pennsylvania’s site files using the PASS (Pennsylvania Archaeological Site Survey) form. 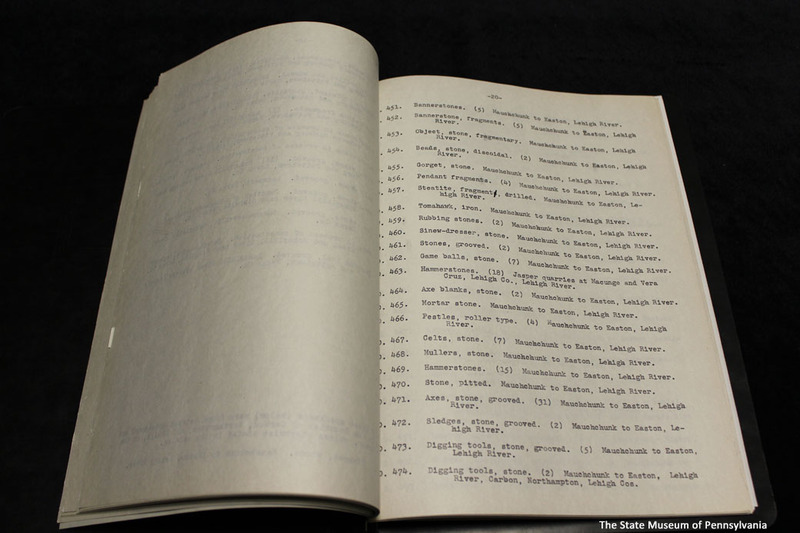 Today we’ll be taking a look Henry K. Deisher’s (1867-1951) contribution to the Section of Archaeology’s collections. Deisher’s collection, acquired by the State Museum in 1917, includes over 15,000 (closer to 24,000 by one account) prehistoric artifacts, primarily from Berks County. 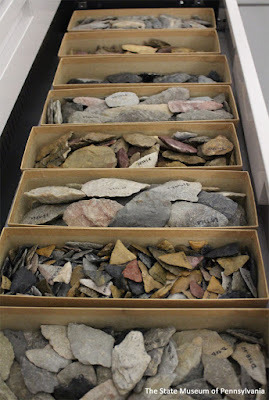 Unlike our previous blog, which highlighted a donated collection with exceptional records, Henry Deisher did not identify artifacts from specific sites, and he often grouped artifacts together by drainage, a fact that has been lamented by researchers who have made use of his collection. H. K. Deisher was an avid lifelong collector of artifacts, finding his first six projectile points in 1873 at the age of seven. His collection quickly grew to immense proportions. Deisher made use of his family’s farmland along Saucony Creek to collect artifacts, expanding his search to include the farmland of relatives and neighbors who apparently had little objection to his obsession. Although specific proveniences and sites were not recorded, the Deisher collection is incredibly valuable for the variety of forms and materials found within it. 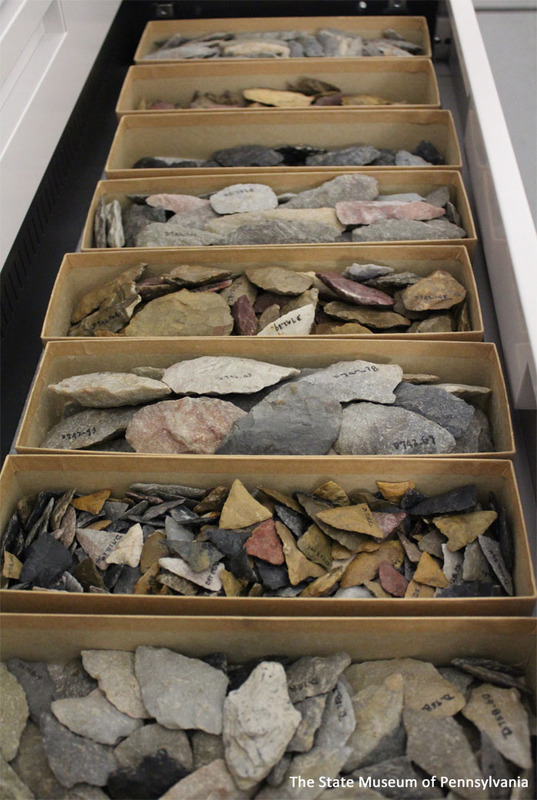 Much of his collection at the State Museum has been sorted into boxes by form, material type and drainage, making the assemblage more useful to researchers. 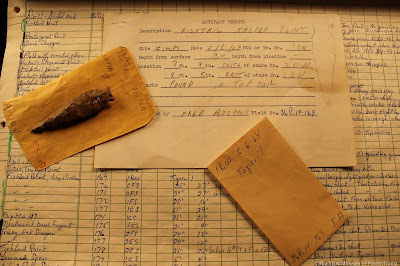 Not limiting his interests to the artifacts themselves, Deisher found the tool stone quarries used by prehistoric people in southeastern Pennsylvania equally interesting. An article detailing these explorations can be found in The Pennsylvania Archaeologist 3(3), published in 1933. His discovery of quarries in Pennsylvania was memorialized by the State Museum in an exhibit depicting a replica of the Flint Hill jasper quarry, which Deisher discovered in 1877 at the age of 10. Although this quarry exhibit has long since been dismantled, one of the three Indian figures used in the exhibit survives to this day, repurposed in the Delaware Village “walk through” at the State Museum in Harrisburg. Deisher at the Vera Cruz Jasper Quarry, Lehigh County, Pennsylvania. In his late teens/early twenties, Deisher traveled west to California where he formed a connection with Reverend Henry Clarkson Meredith, whom he referred to as his “Field Collector”. Meredith was instrumental in acquiring an astonishing, and well-documented collection of California Indian baskets from the classic period (1892-1918). Perhaps most incredible about this collection, not discounting the beautiful basketry, is the accompanying documentation, which includes names of the weavers and photographs of them with their baskets. Nowhere else does such a collection of California basketry exist. The majority of Deisher’s collection of Pomo basketry was sold the University of Pennsylvania in 1918 where it resides today. The collector and some of his favorites. If you would like to donate your collection for curation at the State Museum, please contact Kurt Carr at kcarr@pa.gov or Janet Johnson at janjohnson@pa.gov. Help us to preserve our archaeological heritage by collecting responsibly and organizing/cataloging your discoveries. We ask you to join us in ensuring that our archaeological heritage is preserved by supporting public programs and preservation laws so that we can protect the past for future generations. 2003 Along the Saucony: The Kutztown Area’s Early Inhabitants. Kutztown Area historical Society, Pennsylvania. 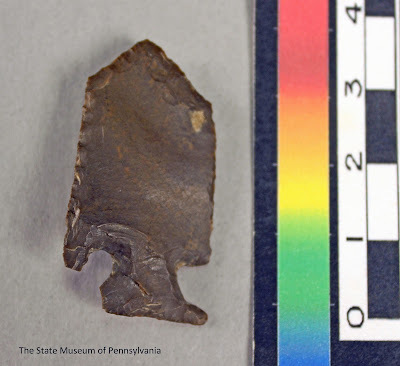 This week in Pennsylvania archaeology, we are going to take a look at important aspects of field work that make or break a project’s use for future research. We will do this by looking at the Zimmerman site, a site that was described in a previous blog that highlighted the excavators, their excavation methods and the importance to our work. For more information on the this site, see our previous blogs titled, In Memorium, Fredrick Assmus January 6, 1946-October 14, 2012, The Werner Collection and the Archaeology of Pike County. Many of the State Museum’s archaeology collections have been donated by amateur archaeologists who are doing their part to further archaeological research. One group who did this is Lenape Chapter 12 of the Society for Pennsylvania Archaeology (SPA). 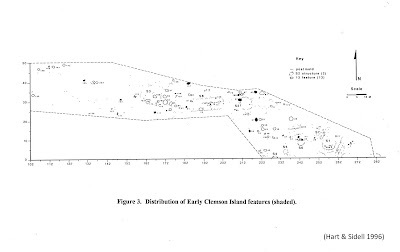 Chapter 12 conducted a survey of the proposed Tocks Island Reservoir area in the spring of 1962. Based on three positive test pits on Marie Zimmermann’s property, additional excavations were conducted beginning in May of 1962. Members of the chapter who worked on this site included Fred Assmus, William DeGraw, Frank Loux and David Werner. Their excavations led to the discovery of a multi-component Late Archaic (4850-6850 BP.) through Late Woodland (1550 AD-1000 BP.) site. A total of 409 features were identified including many small and large pits, hearths and postmolds. 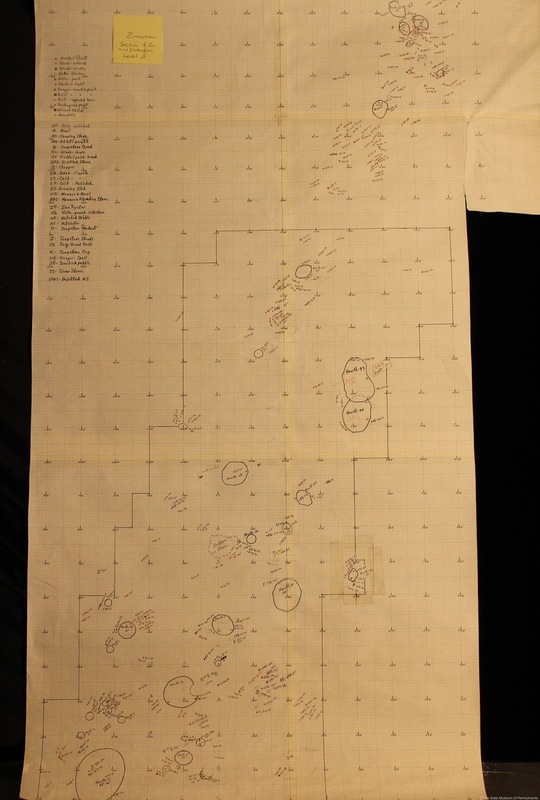 The Section of Archeology has inventoried David Werner’s entire donation (including 12,837 artifacts) and is half way through inventorying William DeGraw’s donation. There are currently a total of 13,397 artifacts and this count will increase as the remaining portions of William DeGraw’s and Fred Assmus’ collections are inventoried. As demonstrated by the numbers listed above, this site was large and had the potential to provide a significant contribution to our understanding of how people lived in the past, especially from the Late Archaic through the Late Woodland period. The archeological site context is most important to our understanding of how and why artifacts were made and used and how humans interacted with one another and the environment. This is the reason that archaeologists map and record in-depth information of how, where and what is being excavated during the investigation. The Chapter also recorded this site in the Pennsylvania Archaeological Site Survey files along with several other sites they had individually or collectively excavated. Site recording is the first step in the cataloging process. Once the site is recorded in relationship to all other sites, settlement systems can be analyzed. Chapter 12 went to great lengths to keep detailed notes. 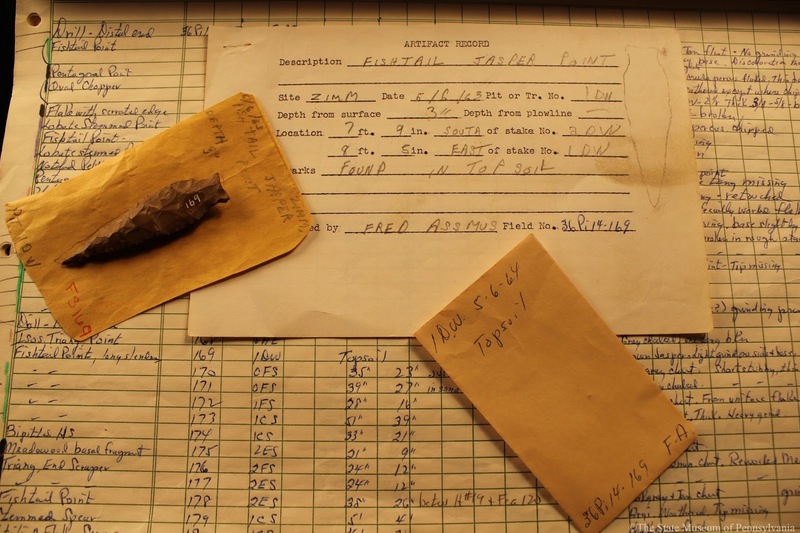 Specifically, David Werner diligently recorded and organized feature and artifact records, created artifact inventories and produced detailed maps of the site, which included feature and artifact locations. As noted above, this information is imperative to interpreting how the site was used and the activities that were conducted there. Mr. Werner’s work and organization is a fantastic example of how to record artifacts and features on a site. By creating site maps for each unit and each level of those units, Mr. Werner was able to identify the relationship between features and artifacts. 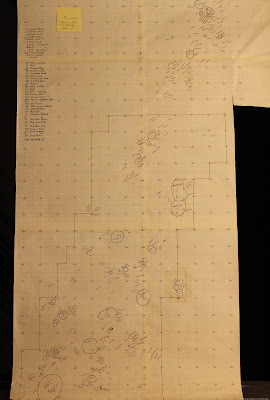 In conjunction with artifact and feature records, field specimen inventories and Mr. Werner’s labeling system, maps and notes the process of creating the Section of Archaeology’s standard inventory was straight forward. This allows us to have collections ready for research sooner and with a known high degree of accuracy of artifact location and dating. In the Section of Archaeology we used to receive collections with limited provenience (the three deminsional location of an artifact or feature) information often, making these artifacts minimally useful in understanding how and why these objects were being used in the larger cultural context. Though each artifact has a story of its own, as archaeologists we need this context to accurately interpret and piece together the human experience through time. So, as archaeologists, we hope that future collectors may heed our words on the importance of provenience and making detailed notes, maps and even photos of where one is collecting artifacts. Then follow this with a catalog and artifact labeling method in a method that others can determine the provenience of the artifacts. The State Museum of Pennsylvania, Hall of Anthropology & Archaeology currently has a rotating exhibit highlighting individual collectors, their donations and the varying degrees of information given to us about the sites. This exhibit also provides information on useful tools for processing artifacts, such as how and what materials to use to best label artifacts. This exhibit will soon be changing from highlighting Fred Assmus, one of the excavators and donors of the Zimmermann collection, to Doris Freyermuth, another avid collector who did her part in providing good provenience information on collections from several sites in the Delaware Valley. These are just a few of the prolific collectors whose collections we have had the honor to work with and curate for the benefit of researchers. To see more information on Freyermuth and others, please visit the State Museum now and in the future as we continue to change this exhibit. 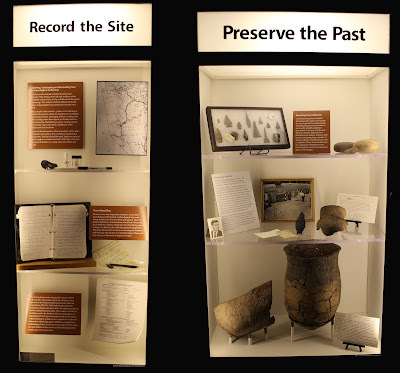 We hope you have enjoyed learning how to organize and care for your archaeological discoveries and we encourage you to visit the CRGIS web site to record your site information. If you would like to donate your collection for curation at the State Museum, please contact Kurt Carr at kcarr@pa.gov or Janet Johnson at janjohnson@pa.gov. Help us to preserve our archaeological heritage by collecting responsibly and organizing/cataloging your discoveries. We ask you to join us in ensuring that our archaeological heritage is preserved by supporting public programs and preservation laws so that we can protect the past for future generations. Jack’s Reef Pentagonal and Jack’s Reef Corner-notched points are distinct markers in the prehistoric archaeological record of the Middle Atlantic (including Pennsylvania), the Midwest, and the Northeast. The angled blade margins create four sides with a straight or slightly concave base. The base creates a fifth margin in both the pentagonal and corner-notched forms. 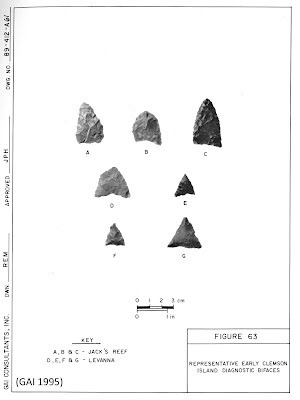 Concurrently in northwestern Pennsylvania and parts of the Midwest, the Raccoon-notched point variety, a smaller pentagonal point, was also utilized and is sometimes found in the same archaeological contexts as slightly larger Jack’s Reef points. It is interesting that the Jack’s Reef style or type was used for a relatively short span of about 500 years (950 - 1450 BP) but over a large geographic area (from Michigan to Maine) by many different Native American groups. It is the generally agreed that these very distinctive projectile points represent the widespread incorporation of the bow and arrow into the prehistoric tool kit about 1500 years ago (Justice, 1987). Triangle points have been found as early as Middle Archaic contexts in Pennsylvania and other states, indicating that bow and arrow hunting technology may have been used prior to the Woodland period. However, these early triangles are not common and it is unclear if they represent bow and arrow technology. 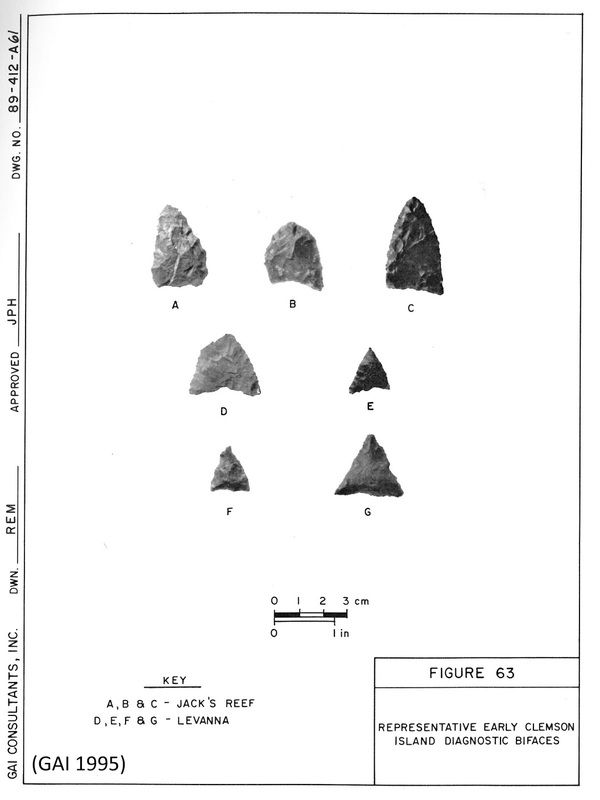 The relatively larger projectile point styles and the presence of bannerstones in Archaic contexts support the assumption that spears and atlatl darts were the primary implements used in hunting activities prior to the presence of Jack’s Reef points. They are produced using a refined pressure flaking technique to create a flat thin blade or flake blank which is further refined with pressure flaking. Recent excavations in Virginia and Delaware have uncovered flake cores used to create Jack’s Reef preforms. The technique is described as “pseudo- Levallois” or “Levallois-like” (Lowery 2013; Walker 2013, New Jersey). While other core techniques may have been used to create Jack’s Reef Points in other regions, including parts of Pennsylvania, the point pictured below was also made from a flake blank, rather than a bifacial preform. The smooth ventral surface of the original flake from which this point was made is clearly visible. 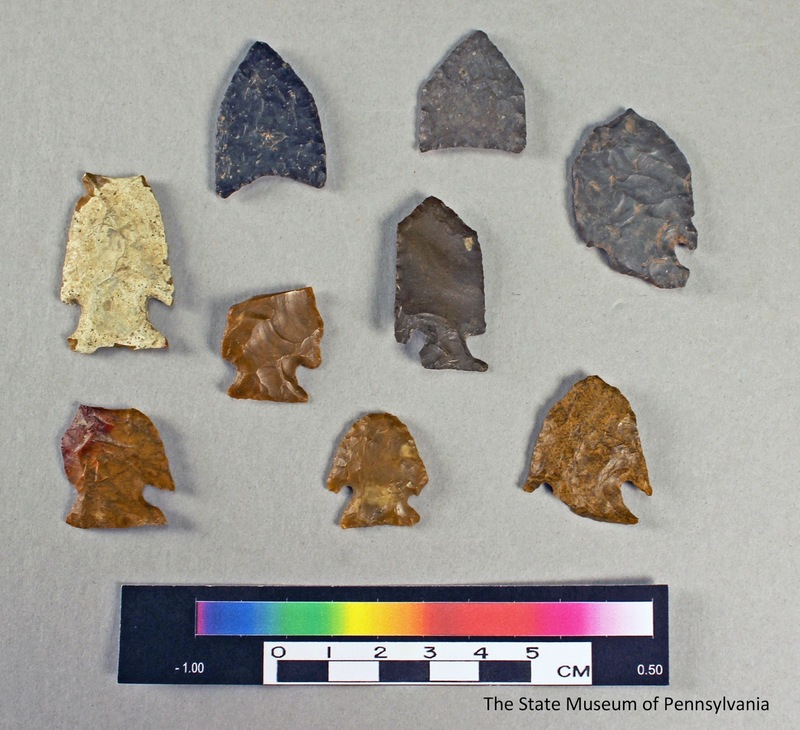 Jack's Reef points were preferentially made from cryptocrystalline lithic materials, predominately high quality local chert in western Pennsylvania and local cherts as well as Hardyston jasper in the Susquehanna and Delaware River basins. McCounaghy (2013) concludes the reliance on local source material and the wide spread adoption of the Jack’s Reef point style by different cultural groups throughout Pennsylvania is evidence that the introduction of this point style does not represent a mass migration of people, but rather the diffusion of ideas through cultural interaction between existing populations. As an example, in the Ohio drainage of western Pennsylvania, Jack’s Reef points are utilized by two distinct groups, the Late Watson Farm in the southwest and Allegheny River cultures in the northwest. Both the Late Watson Farm and Allegheny River complexes demonstrate continued influence and interaction with the post-Hopewellian cultures of the Ohio valley. Archaeologists specializing in the Midwest tend to use a different set of chronological terms for this time period, placing the end of the Hopewell sphere of influence around A.D. 400 as the end of the Middle Woodland. Therefore in western Pennsylvania literature, Jack’s Reef points are classified as Late Woodland (McConaughy 2013). Obviously, this has created some confusion in the archaeological literature. In eastern Pennsylvania, this cultural period is commonly referred to as the late Middle Woodland. 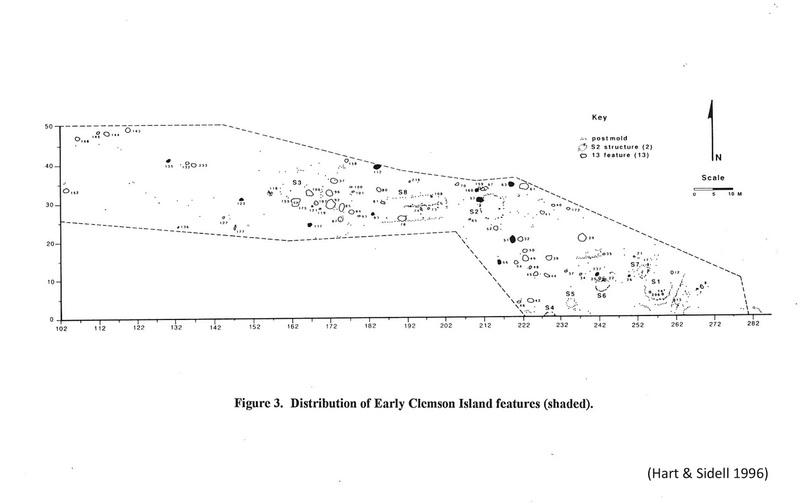 Jack’s Reef points are associated with the early and middle Clemson Island culture in the West branch and Juniata Valley of the Susquehanna River basin, and the Abbott Farm Complex of the lower Delaware. It is widely theorized that the adoption of the bow and arrow co-occurred with the intensification of food production using weed seed plants of the Eastern Agricultural Complex (EAC) as well as potentially experimenting with maize horticulture. However, the current understanding of this pivotal time period—the transition from a foraging life style to one of intensive maize horticulture, in villages with complex tribal social organization—is limited by the paucity of the archaeological record. Relatively speaking, very few sites have been recorded for this time period as compared to the preceding Late Archaic and subsequent Late Prehistoric/Late Woodland periods. Additionally, very few of those sites recorded have been systematically excavated with particular emphasis on recovering the floral and faunal record. Jack’s Reef projectile points are an important temporal marker of a very interesting time of transition in Pennsylvania prehistory. A comprehensive summary of the larger historical and regional context of the Jack’s Reef phenomenon is available in the Eastern States Archaeology Federation (ESAF) publication, Archaeology of Eastern North America (AENA), 2013, Volume 41. It is a compendium of the papers delivered at the 2012 ESAF meeting, After Hopewell: The Jack’s Reef Horizon and Its Place in the Early Late Woodland Mortuary and Settlement Patterns in Northeastern North America. 1995 Archaeological Investigations at the Memorial Park Site (36Cn164), Clinton County, Pennsylvania. Final Report. On file The State Museum of Pennsylvania, Section of Archaeology. 1996 Prehistoric Argicultural Systems in the West Branch of the Susquehanna River Basin, A.D. 800 to A.D. 1350. Northeast Anthropology, 52:1-30. 1987 Stone Age Spear and Arrow Points of the Midcontinental and Eastern United States, 215-220. 2013 Jack’s Reef in the Chesapeake and Delmarva Region: Research into the Coastal Archaeology of the Era Between Circa cal A.D. 480 and cal A.D. 900. AENA 41:5-30. 2013 An Examination of Jack’s Reef in New Jersey. AENA 41:47-58.